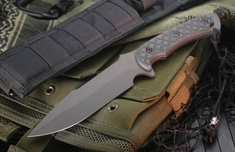 The Spartan Horkos is developed by Spartan Blades and created by Curtis Iovito and Mark Carey. 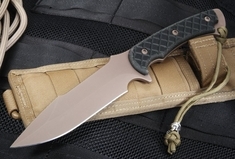 The 5.75" fixed blade is made from Stainless CPM S-35VN Steel and comes in either Dark Earth or Flat Black, making this knife simple yet stylish. The blade is 0.1875" thick. The full tang handle gives the knife a solid grip and comes in a Canvas Micarta. The Horkos all-around combat and utility knife is perfect for military professionals or others looking for knifes used by professionals. As an authorized dealer, we sell a selection of Horkos knife models with a full satisfaction guarantee, free US shipping and same business day shipping.